While our family does not have many new year traditions there are a few that we adhere to. GeekDad and I are not really party people. We would much rather stay in, cuddle on the couch, and watch Stargate Universe so partying doesn’t really fit into our celebration. One tradition that is set in stone though is college football. There is always a football game on. I couldn’t tell you who all the players are or even all the positions on the team, but there is just something about the ball passing and tackling that I love to watch. It doesn’t hurt that my favorite team is frequently in a bowl game either. Boomer Sooner! Another tradition we have comes from our Southern roots. 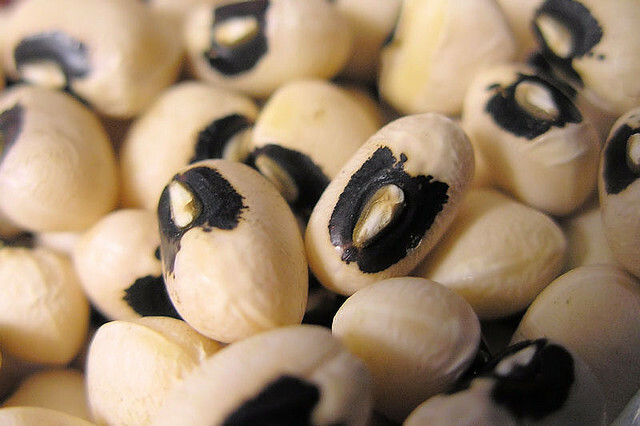 Eating black eyed peas on New Years Day dates back to the Civil War and beyond. I hate those beans with a passion. They taste like dirt to me and I have no interest in cooking with a hog jowl. (What is that anyway?!) But not one to rock the familial boat we have some from a can. I usually eat some. Ok, just one but still. Blah. I think I will start a new tradition this year and listen to The Black Eyed Peas rather than eat some. That will still be lucky, right? One other thing we do is stay up and watch the ball drop in New York. I enjoy seeing all the places celebrating and sometimes even the entertainment they have on the show. Of course, there are always the resolutions, though this year I started my big one before Christmas. OK, Geek brigade, do you have any traditions you want to share or resolutions that you need to proclaim publicly to keep you honest? We do the whole southern traditional meal: black-eyed peas, collards, ham and cornbread. I love it, but it’s probably not for everyone. We always tune in to watch the “ball drop,” but I think I might go mad watching the entire New Year’s Eve special. We’ll make new traditions with our son as he gets older, but for now, food traditions are the easiest for us to keep. I’d never heard of Hoppin’ John until I came across it in a cookbook. I’m 100% Yank anyways. Pork cheek?! Blah. Now I know I would pass on the hog jowl.